Ringo Starr has said he decided to sell off some of his Beatles memorabilia because he owns so much he doesn’t get time to appreciate it himself. Over 800 items owned by the Beatles drummer and his wife, Barbara Bach, are going under the hammer, including rare memorabilia like his three-piece drum kit used in over 200 performances and a Rickenbacker guitar known as the ‘Beatle-Backer’ that John Lennon owned and later gave to Ringo. The unprecedented number of Beatles-owned objects will be offered for sale on December 4 and 5 at Julien’s Auctions in Beverly Hills, California. “We have so much stuff and a lot of it we haven’t seen in 20 to 30 years,” Starr, 75, said in a phone interview with Bach. He said the idea for the auction came after The Grammy Museum in Los Angeles asked to do an exhibition about his life and music in 2013-2014. “It started with me looking at storage units we have all around the world… We found we had so much stuff,” he said. Then another project – an upcoming book and an exhibition currently at London’s National Portrait Gallery of photographs Starr took of his former band mates – turned up “boxes of negatives from the ’60s onward”, he said. On top of that, the couple sold their country house in England and closed down their apartment in Monte Carlo. “We thought, ‘What are we going to do with all this stuff?’” he said. So they turned to Julien’s Auctions. “Beside the dinner services and glasses, I thought I will make it very special… I’m also putting in ‘The White Album No. 1′ which I had in a bank vault for the last 35 years,” and several guitars, including a Gretsch that was a gift from George Harrison and the Lennon Rickenbacker, he said. “And besides that you have furniture, artwork and cups and saucers” from their homes in London, Beverly Hills and Monaco, said Starr, who soon heads off on a month-long tour of North America with his All-Starr Band. Like his book Photograph by Ringo Starr, coming out later this month, a portion of the proceeds will benefit the couple’s Lotus Children Foundation that focuses on social welfare issues around the world. “We’re fed up with having the stuff in storage when it could be put to some good use and also give a lot of people joy,” he said. The couple, who have been married for 34 years, said they decided together what items to auction, an effort that was wrought with emotion and nostalgia. After deciding to let go of certain items “we’d take them back”, said Bach, 69, a former model and actress. Highlights will be on display for a week at The Hard Rock Cafe New York in Times Square from November 16. They will also be shown at the Museum of Style Icons in Ireland and at Julien’s prior to the sale. Julien’s anticipates the sale could top £3.2 million to £6.5 million. “It’s really a once-in-a-lifetime opportunity. 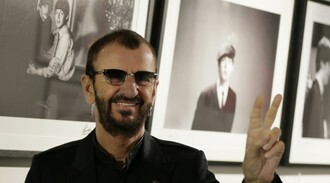 Ringo will never do this again. They are the only items he’s letting go,” said auctioneer Darren Julien.